[prsk,pret] = plotFrontier(obj) estimates the efficient frontier with default number of 10 portfolios on the frontier, and plots the corresponding efficient frontier for Portfolio, PortfolioCVaR, or PortfolioMAD objects. For details on the respective workflows when using these different objects, see Portfolio Object Workflow, PortfolioCVaR Object Workflow, and PortfolioMAD Object Workflow. [prsk,pret] = plotFrontier(obj,NumPorts) estimates the efficient frontier with a specified number portfolios on the frontier, and plots the corresponding efficient frontier. The number of portfolios is defined by NumPorts. 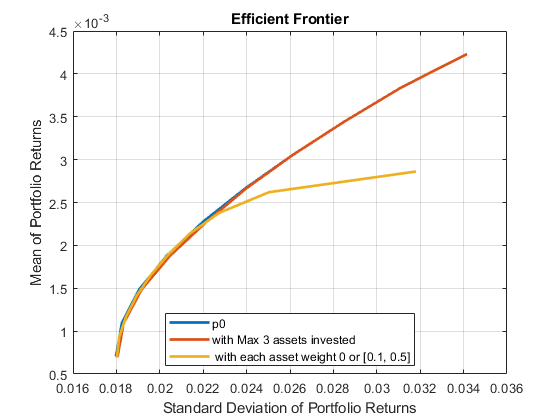 [prsk,pret] = plotFrontier(obj,PortWeights) estimates efficient portfolio risks and returns with PortWeights, and plots the efficient frontier with those portfolios. This syntax assumes that you provide valid efficient portfolio weights as input. PortWeights is a NumAsset-by-NumPorts matrix. [prsk,pret] = plotFrontier(obj,PortRisk,PortReturn) plots the efficient frontier with the given risks and returns. This syntax assumes that you provide valid inputs for efficient portfolio risks and returns. PortRisk and PortReturn are vectors with the same size. plotFrontier handles multiple input formats as described above. Given an asset universe with NumAssets assets and an efficient frontier with NumPorts portfolios, remember that portfolio weights are NumAsset-by-NumPorts matrices and that portfolio risks and returns are NumPorts column vectors. 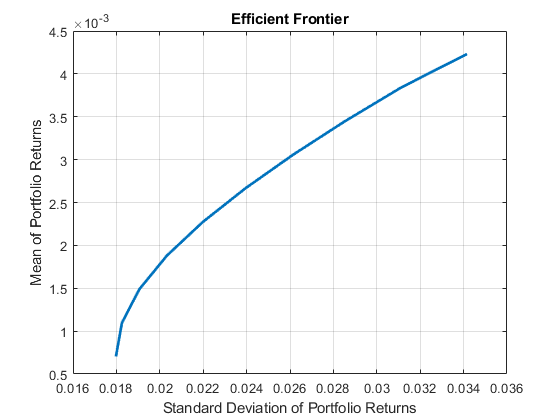 Given a portfolio p, plot the efficient frontier. Use plotFrontier to compare the different portfolio objects. Define a target return and use estimateFrontierByReturn to compare the three portfolio objects. The following table shows the final allocation for specified target return among the three portfolio objects. You can see that the small positions in 'AAPL'and 'HPQ' are avoided in pwgtConditionalBound, and only three assets are invested in pwgtWithMaxNumAssets. Given a PortfolioCVaR p, plot the efficient frontier. 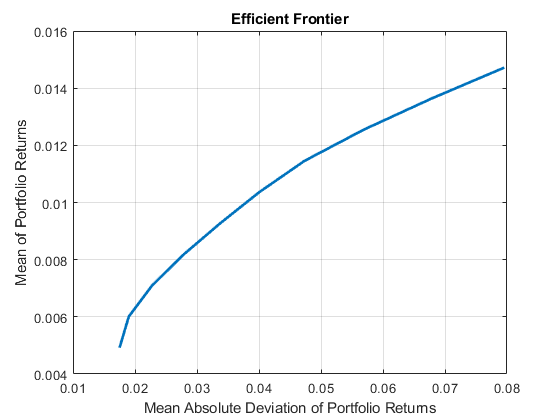 Given a PortfolioMAD p, plot the efficient frontier. 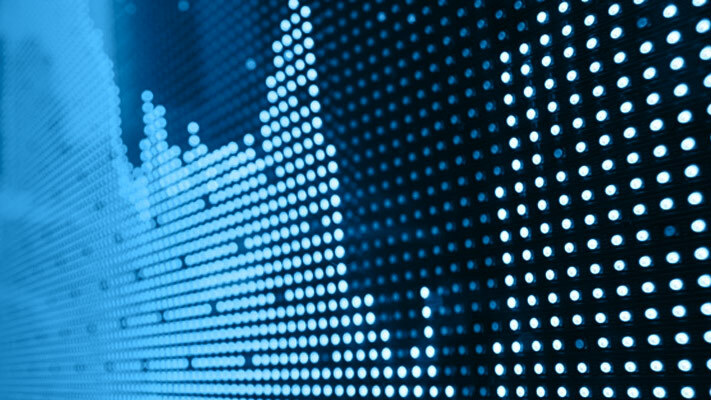 Standard deviations of portfolio returns for each portfolio, specified as a vector. PortRisk and PortReturn must be vectors with the same size. Means of portfolio returns for each portfolio, specified as a vector. Optimal portfolios on the efficient frontier, specified as a NumAsset-by-NumPorts matrix. 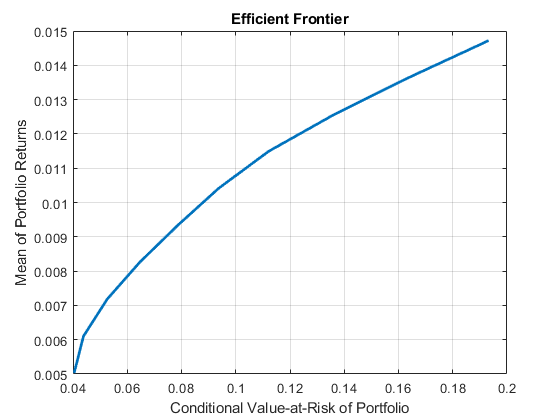 Estimated efficient portfolio risks (standard deviation of returns, returned as a vector for a Portfolio, PortfolioCVaR, or PortfolioMAD input object (obj). If the portfolio object has an initial portfolio in the InitPort property, the initial portfolio is plotted and labeled. If portfolio risks and returns are inputs, make sure that risks come first in the calling sequence. In addition, if portfolio risks and returns are not sorted in ascending order, this method performs the sort. On output, the sorted moments are returned. Estimated efficient portfolio returns, returned as a vector for a Portfolio, PortfolioCVaR, or PortfolioMAD input object (obj). You can also use dot notation to plot the efficient frontier.